Summertime is salad season around our household. We love the delicious varieties of fresh fruit that are available. I love to include apricots, as they have been a favorite since childhood when my grandmother introduced me to them. I love to stuff them with goat cheese and roast them to include in our salads. Another way I elevate the flavors in my salads is by including several products from Honey Ridge Farms. This salad recipe includes both their Clover Honey Crème and Balsamic Honey Vinegar. They provide the perfect kiss of sweetness. Since we are in an area of the country where it gets very hot and humid during the summer months, I like to prepare my salads early in the morning when it is cool and place them in the refrigerator until dinner time. Ball One Quart Wide Mouth Jars are great vessels to use to store your salads in until you are ready to use them. They will keep your salads fresh in the refrigerator for 3-4 days. I store my vinaigrette separately in a small jar with a lid. I think you will enjoy this salad, especially the sweet and spicy combination of flavors on the walnuts and in the vinaigrette. 1) Wash all fruit and thoroughly pat dry with paper towel. 2) Wash arugula and pat dry between two paper towels. Make sure it's completely dry. 3) Cut apricots in half and remove pits. 4) Place 1 Tablespoon of goat cheese on each apricot half, then top with one blueberry. 5) Place goat cheese stuffed apricots under broiler on high heat for 4-5 minutes, until cheese bubbles and is slightly brown. Remove from oven and let cool. 6) In a bowl, toss walnuts with 2 teaspoons Honey Ridge Farms Clover Honey Crème and 1/4 teaspoon Cajun seasoning. 7) Place on foil lined cookie sheet. Bake in 350°F oven for 10 minutes. Remove from oven and cool. 8) Cut strawberries in half. 9) Layer ingredients between 2 one-quart ball jars. Start with a hand full of arugula in each jar, divide strawberries between two jars, add another hand full of arugula in each, divide blueberries between two jars, divide walnuts between two jars and then last nestle two of the stuffed apricots on top or each jar. 10) Add lids and place in refrigerator until you are ready to serve. Combine all the ingredients in a jar with lid, shake well. Refrigerate until ready to use. (*if you like spicy, you should use the full teaspoon of Cajun seasoning). Remove apricots from jar and place on serving plate. Empty the rest of the salad on serving plate and lightly toss. Vigorously shake jar of vinaigrette, then drizzle a generous amount on salad. Each jar is one large dinner-sized serving, or two small side salads/servings. 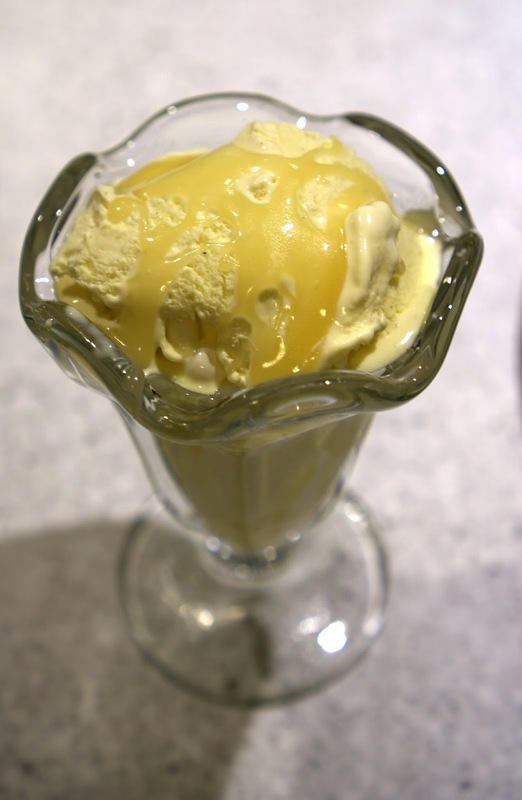 This delicate, delectable ice cream is restaurant quality. Whether you say it tastes of fresh sopapillas or a cinnamon flan, it will knock your socks right off! 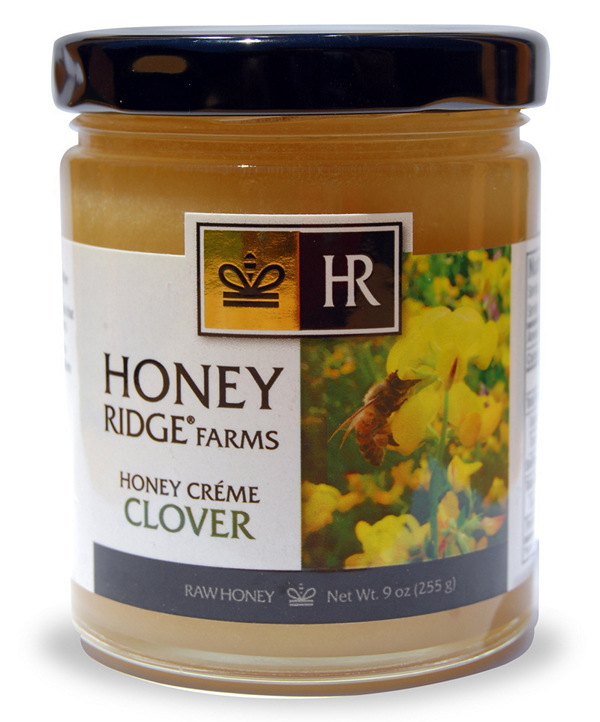 The secret is the smooth honey of Honey Ridge Farms Clover Honey Crème - whose leftovers can be poured over any of your favorite desserts! Add the milk and cream to a medium saucepan along with the cinnamon-stick pieces​ and vanilla. On medium-high, heat the mixture until steaming, but not boiling, and remove from heat. Allow the milks and spice to steep for about 60 minutes. Meanwhile, whisk the yolks in a bowl along with the sugar. After steeping, return the milk mixture to medium-high until steaming again. Then add a small amount of the warm mixture to the yolks, mixing constantly, to temper the yolks. Repeat several times until all the milk has been incorporated. Pour the custard base back into the saucepan. On medium, cook - stirring constantly - until the mixture has thickened enough to coat the back of a spoon. Remove from heat. Strain the custard through a mesh colander, add the ground cinnamon and salt and place in a covered container. Cool in the fridge for at least 2 hours or up to all night. When cold, place into your ice cream maker and use according to your machine's instructions. Once churned, return the custard to a covered container and freeze until set, at least 2 hours. Meanwhile, make the honey-caramel shell. ​Melt the butter in a small saucepan over medium heat. Add the honey and salt, stirring constantly, and continue to heat until the mixture bubbles and thickens slightly. It may turn a mildly toasted color, but should be allowed to caramelize no further. Pour mixture into a sealable container and allow to cool at room temperature. ​To serve: If too cool to pour, heat the honey-caramel for 15-20 seconds in the microwave - but not hot enough to melt the ice cream. Drizzle the caramel in the serving ​dish, then scoop in the ice cream. Top with more caramel, which should harden to a delicious, chewy consistency. Enjoy! The Balsamic Honey Vinegar and Clover Honey Crème from Honey Ridge Farms bring a rich, earthy sweetness to this flavorful recipe. Perfect for your indoor or outdoor grilling, the combination of honey, chipotle, soy and mustard create the perfect marinade for pork, chicken or beef. Place pork pieces in a large baking dish. Sprinkle liberally on all sides with salt and pepper. Whisk together marinade ingredients and pour over pork. Toss to coat evenly. Cover and refrigerate for one hour, or overnight. Preheat oven to 325°F. Heat ovenproof indoor grill pan to medium-high heat. Whisk together glaze ingredients and set aside. Remove pork from marinade and pat dry, discarding marinade. Brush grill pan lightly with oil. Grill pork over medium-high heat until browned, 3-4 minutes per side, turning once to create hatch marks (if desired), taking care not to burn. Place pan of pork into oven and bake for 30 minutes. Baste pork liberally with glaze, then bake for 15-20 minutes more, or until internal temperature reaches 140°F. Rest pork for 10 minutes before serving. Cook’s note: You may also grill over a charcoal or gas grill, basting and finishing over indirect heat. My mom used to make cream puffs all the time when I was little (I think it was a 70’s thing). She would fill them with vanilla or chocolate pudding and top with chocolate ganache. Many years after moving away from home, I asked her about them and her response was “oh they are SO easy to make!” As a kid, I guess I always thought they looked fancy, so they must be hard to make. But Mom (as always) was right - they are easy to make, good for making ahead, and they really do look fancy! I wanted to make a filling lighter than pudding, but not just plain whipped cream. I settled on a combination of cream cheese, honey crème, and whipped cream. The filling is light, has a great honey flavor, a hint of cream cheese flavor and is not overly sweet, but completely delicious! To make the shells, combine water, butter, sugar and salt in a medium saucepan over high heat. Bring to a boil, stirring occasionally. Remove from heat and add flour, all at once. Return to heat and cook, stirring constantly, until flour is completely incorporated and forms a ball of dough. Remove from heat and let cool in pan 5 minutes. Still off the heat, stir in eggs, one at a time, fully incorporating each before adding the next. Place golf-ball sized portions of dough onto a baking sheet lined with parchment paper or a silicon baking mat (you should have about 12 balls of dough). You can use a small ice cream scoop for this, or a piping bag if you have one. Smooth out the tops of dough using a little water and your finger or a spoon. Bake at 400°F for about 20 minutes or until lightly browned. Remove from oven and use a paring knife to cut a small slit into the side of each shell to let the steam escape. Let cool completely. These can be made a day ahead and kept in an airtight container, or made up to a month ahead and frozen. Re-crisp in the oven at 350°F for about 10 minutes and let cool completely before filling. While the shells are cooking and cooling, pour heavy cream into a cold stainless steel bowl and add the cream of tartar. Using an electric mixer, whip cream until stiff peaks form and refrigerate. Using same beaters, whip cream cheese in a separate bowl for a few minutes until fluffy. Add honey crème and whip for a few more minutes, making sure all honey crème is incorporated. 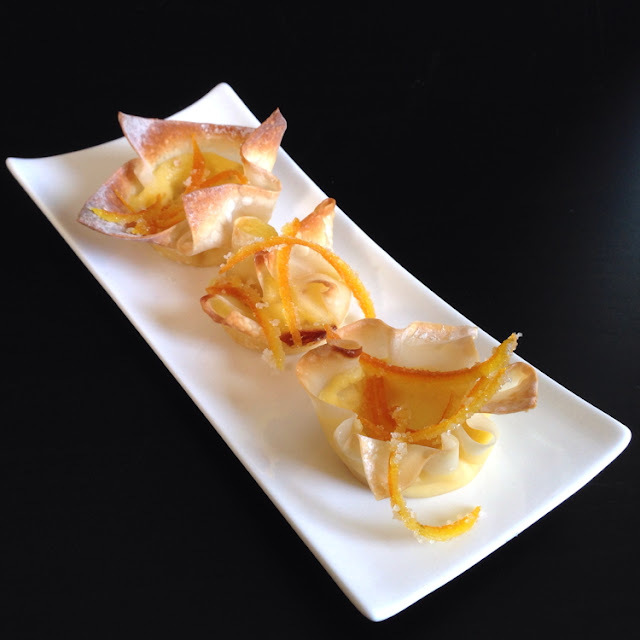 When you are ready to assemble the profiteroles, fold the whipped cream into the cream cheese/honey mixture. Again, you can use a piping bag or just a spoon to fill the shells. Cut the shells in half horizontally, and pipe or spoon the filling into the bottom half of the shells. Sprinkle some thyme leaves onto the filling and place the top of the shell onto the filling. When ready to serve, drizzle the tops of the profiteroles with more honey crème. Enjoy! When I was a kid, my mom made a salad that was incredibly simple: Sliced ripe summer tomatoes, salt, pepper, vinegar and sugar. It almost sounds too simple, right? But, summer tomatoes don't need a whole lot. And with that salad, every single ingredient served to enhance the tomatoes rather than cover them up. I usually make that same salad at least once over the summer, sometimes making it more sweet, and other times edging towards the puckery-tart. But this time, I decided to change things up a bit. Instead of using sugar, I decided to use honey. And not just any honey - I used Clover Honey Creme from Honey Ridge Farms. I wanted to find a way to use the honey in its purest form, not cooked into something. Short of eating it with a spoon (which I might or might not have done - it's really good!) I was stumped. Well, I could have drizzled it on ice cream or English muffins. Despite those being delicious ideas, they wouldn't have been a very good recipe. But, when I brought tomatoes home from the farmer's market, I had the idea of using the honey with the tomatoes. Remove the core from the tomato and slice into thin wedges. Arrange the slices on a plate - I alternated the red and green, but you could put all red on one side of a the plate and all green on the other. And, of course, you could use just one large tomato. Or use several tomatoes to make a whole platter for a party. Sprinkle on salt and grind on the pepper, then strew the thyme leaves on top. Drizzle on the honey cream in thin strands. I used a fork to portion the honey. Drizzle on just a little bit of vinegar. I know you've seen this on TV, where you put your thumb over most of the opening of the bottle and just shake on a small amount here and there. You can refrigerate the leftovers, but the tomatoes tend to get a little soft. They still taste good, but the presentation isn't as nice. I was chatting with a friend recently about his upcoming move to North Carolina when he mentioned that he once lived there "way back in the 90's." This immediately sparked a mental mini conversation with myself. "Were the 90's really that long ago? I mean I know the 80's are retro, but do we have to throw the 90's in there now too? Wasn't it just yesterday that I was doing the Macarena and checking the TV guide for when the next episode of The Cosby Show was on!" Noticing the mental struggle I was having by the puzzled look on my face, my friend chuckled and reminded me that time really has flown by. So, I conceded to the idea that the 90's were far enough in the past to now celebrate them and some of its trends as vintage style. Therefore, I pulled this warm goat cheese salad recipe out of the 90's vault and gave it a dash of current foodie flair with some roasted figs and sweetened the deal with a couple of Honey Ridge Farms amazing products. Thanks to living out a third of the 90's in Belgium as an expat, I have many fond memories of this dish. In fact, after discovering this French creation in our French speaking city of Brussels, I am sure I ate every version that existed across Europe during those few years. When you love something enough to know how to order it in French, you just go with it. A combination of crisp warm tangy cheese atop delicate greens tossed in perfect vinaigrette and a drizzle of honey to top it all off became my European comfort food that smoothed out the rough edges of moving to a place much more drastic than North Carolina. Prepare goat cheese: Place panko, thyme, salt and pepper in shallow dish. Beat egg whites until foamy in a separate shallow dish. Press each goat cheese round into 1/4-inch disk. Dip goat cheese rounds, one at a time, into egg whites then into panko mixture, pressing crumbs slightly into goat cheese. Place all goat cheese rounds onto a tray and chill for at least one hour. Prepare honey vinaigrette: In a small mason jar with a tight fitting lid, add all vinaigrette ingredients, except the oil, and shake to mix well. Next add the olive oil and shake to incorporate. Chill until ready to use. Prepare figs: Preheat oven to 400°F. Put figs, cut side up, on a baking sheet. Melt butter in a saucepan over low heat. Once melted, whisk in honey creme, cinnamon and salt. Drizzle the honey butter over the figs and roast 10 to 15 minutes until figs are soft and gooey. Set aside. Turn oven temperature to 375°F. Remove chilled goat cheese rounds from refrigerator. Using a spatula, place them on a parchment-lined baking sheet. Bake for 10 - 15 minutes, until warm throughout, then finish of under the broiler for 2 - 3 minutes until golden brown. Set aside for several minutes while preparing the greens. Remove vinaigrette from the refrigerator and shake well. Toss dressing with greens and sweet pepper. Divide greens among four individual serving plates. Top each pile of greens with figs and two warm goat cheese rounds. Drizzle some more Honey Ridge Farms Clover Honey Creme on top of the warm goat cheese rounds. Serve immediately. Mix the balsamic and the thyme and put into a meat injector. Inject on opposite sides of the drumsticks. Vacuum seal in appropriate bags for sous vide. Set temperature to 149°F for 6 hours. Place sealed bags in water and forget them. 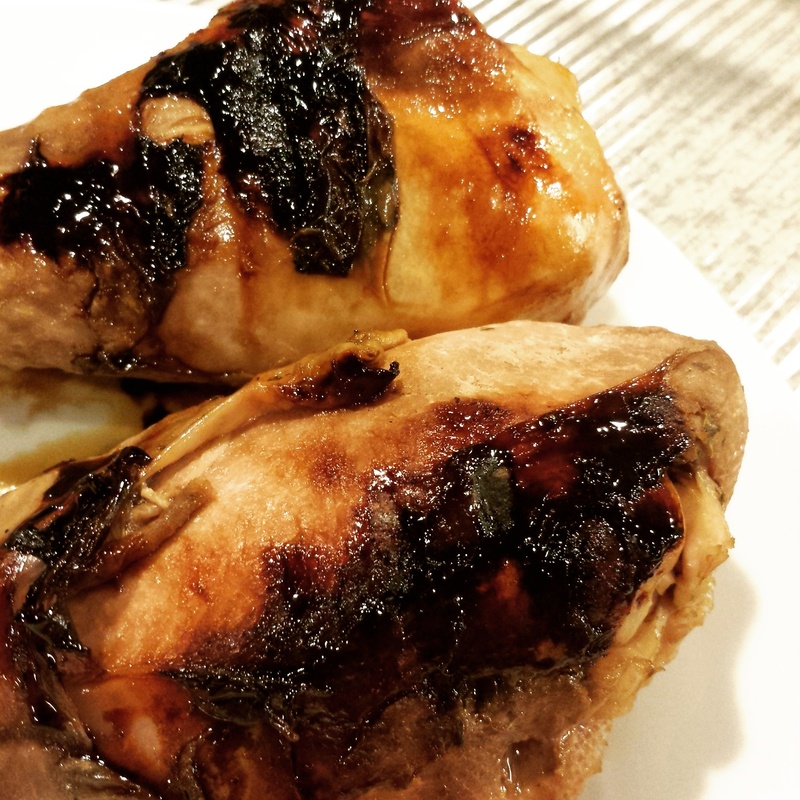 Remove drumsticks from sous vide bag(s) and baste with Honey Creme. 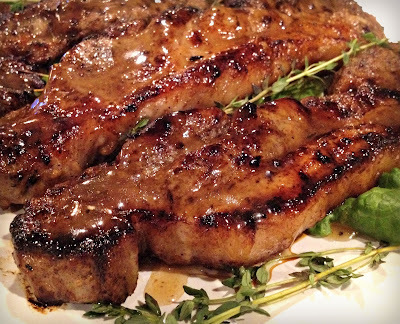 Place on hot grill until honey carmelizes, about 5-10 minutes. Serve with roasted corn brushed with Honey Creme and you will be amazed! Ah, crêpes! 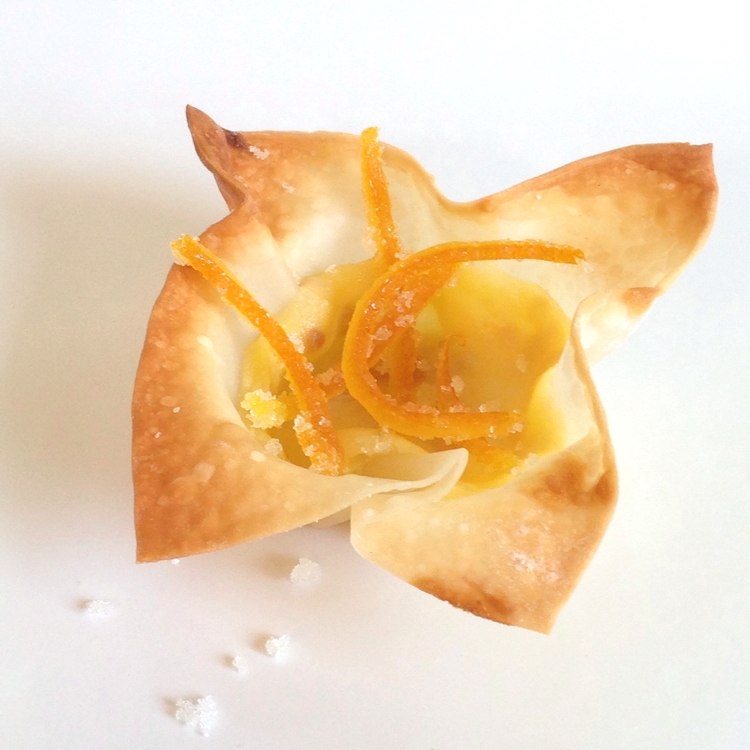 Those sweet (or savory) super thin French delights that most of us adore. Over the years I have made many. And over the years I have failed so many times that I almost gave up. But then...I came across this recipe with the adaptation of the honey creme for the sugar and voila - perfection! It also helps that I have a good non-stick pan, nothing super pricey but one without a bunch of scratches and imperfections in it. Heat and timing are also key here. Do not try and cook it too quickly or you'll burn the butter (and thus the crêpe.) On that note, do not walk away from the stove or you'll have burnt crêpes. It's ok to peek at the underside if you're not sure if it's cooked enough or not. And to be honest, I've even flipped a few back over to get that desired crisp, but delicate, texture. Most importantly: Make a bunch of them. These are a crowd pleaser and will be gobbled up before you know it. Bon Appétit! In a small bowl, whisk together the flour, baking powder and salt. Stir in the milk, Clover Honey Creme, butter, vanilla and eggs and blend until smooth. Let sit 5-10 minutes. Heat a small non-stick 6" skillet on medium-high heat. Lightly butter the pan and pour 1/4 cup of batter inside. Rotate the pan so that the batter forms a thin, uniform layer. Cook 2-3 minutes until the underside is lightly browned. Gently flip the crêpe and cook another minute or so and golden on the underside. Remove crêpe to a plate. Repeat process with remaining batter. In a medium chilled bowl, beat the whipping cream with a hand mixer until soft peaks form. To serve crêpes, top with your favorite fruit and a spoonful of the fresh cream. I have never used honey cream before, so I got really excited and I was really pleased with what I saw when I opened my jar of Honey Ridge Farms Clover Honey Creme. It's whipped and has a nice smooth consistency that is really easy to spoon out and use. Very luxurious, in my opinion. It is perfect for this quick and simple dish. 1) Slice your banana into 1/2-inch rounds. 2) Melt Ghee in large non-stick skillet on medium heat. 3) Place banana rounds in skillet and fry 4-5 minutes on each side, until lightly browned. 4) Remove banana rounds from skillet and place on a plate lined with a paper towel to drain. 5) Clean skillet, removing all remaining Ghee from pan. 6) Return skillet to low heat and add the Clover Honey Creme, gently swirl around. 7) Turn skillet off and place bananas back into skillet. Spoon Clover Honey Creme over the bananas to coat evenly. 8) Sprinkle Orange Peel Zest over bananas, along with a pinch of sea salt. These are great on ice cream, steel-cut oatmeal or even toast. When Honey Ridge Farms sent me a jar of uncooked honey creme, I knew I could make something wonderful. I wanted to highlight the flavor and texture. My kitchen buddy, Tiffany Lamb, suggested I tinker with her sensuous Mascarpone Flowers, and this is the splendid result. I used creme made from clover honey for these simple blossoms; other flavors of the creme are blackberry, blood orange and lemon/lavender. Any of them would work well in this recipe. Preheat oven to 425°F. Spray mini-muffin tin, or grease it. Press one wonton wrapper into each of the 24 wells of the prepared tin, letting the points stick out. In a medium bowl, beat the mascarpone, honey creme, orange peel/zest and salt until thoroughly blended. In a separate bowl, lightly beat the egg with the heavy cream, then pour that mixture into the cheese/honey and stir to combine. Put a spoonful of the filling into each of the wontons; there should be just enough to fill each one. undisturbed, at least 10 minutes. Carefully remove from the tin and let the blossoms cool on a rack. Peel the orange and remove the white pith from the inside of the peel. Cut the peel into thin strips. Put 1 cup sugar and water in a small saucepan, and bring to a boil. Add the orange peel, return to a boil. Reduce the heat and simmer until peel is very soft, then drain. Toss the peel and the reserved sugar on a plate, separating the strips. I love honey. I like baking with it and using it in drinks in place of sugar. I've never tried honey vinegar though, so I was anxious to try the Balsamic Honey Vinegar from Honey Ridge Farms. “Award-winning Balsamic Honey Vinegar is truly unique and delicious aged balsamic-style vinegar made entirely from honey.” I feel a kinship with Honey Ridge Farms since they are from my home state of Washington. I work in the garden center industry and bees are essential to our industry. There are so many versions of potato salad roaming around, but I've never made one like this. With all the fresh ingredients, I was sure it would be a winner, and it was. Serve warm in the fall or cold in summer. Enjoy! Cut potatoes in half, long ways, and add to boiling salted water. Cook until tender, about 20 minutes. They should be fork tender, but somewhat firm. Drain and cool. Cut potatoes into chunks and set aside. Cook bacon until crispy. Chop into pieces when cool. Grill sliced onions in the bacon fat, over high heat, until they are caramelized. 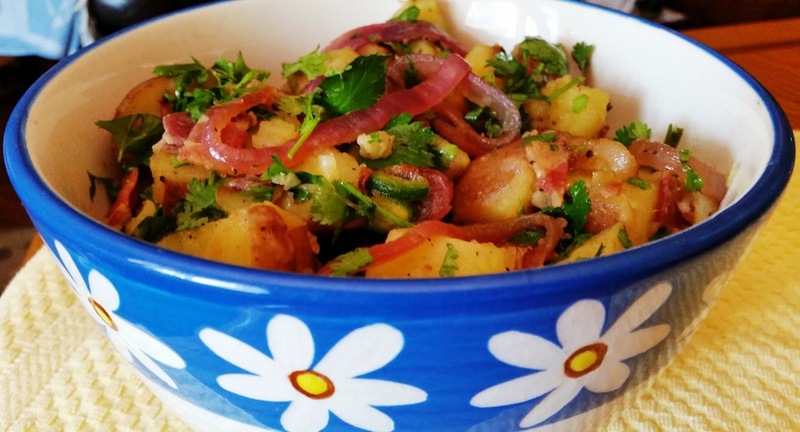 In a large bowl, add the cooled potatoes, salt, pepper, minced Serrano peppers, bacon and chopped cilantro. Combine olive oil and Balsamic Honey Vinegar in a measuring cup and stir. (I started with 1/4 cup of Balsamic and 1/8 cup of olive oil because Mark’s taste buds are not too adventuresome!) Taste and add more salt, pepper or Balsamic Honey Vinegar/olive oil, as needed. Stir well to combine. 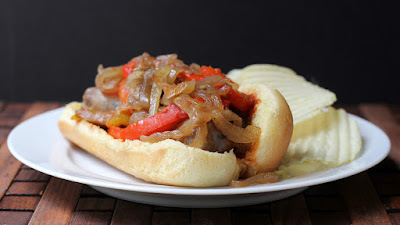 As an ex-Chicagoan, I've got a special love for Italian Sausage sandwiches. This isn't quite the traditional version - I've added a secret special ingredient - the Honey Balsamic Glazed Onions. The onions cook down a lot during cooking, so you'll have enough to top the sandwiches - but probably not much more. I suggest that you just go right ahead and make a double batch - you'll want these for burgers, hot dogs, bratwurst, panini, and pizza. And maybe just for eating. I...um...sampled a lot of the onions before they ever made it onto sandwiches. Heat the olive oil in a medium saute pan. Add the onions, salt and pepper. Cook on medium, stirring as needed, until the onions begin to soften. If they start browning, turn the heat down. Add the balsamic honey vinegar and continue cooking, stirring once in a while, until the liquid is gone. Heat the olive oil in a medium saute pan on medium heat. Add the peppers, oregano, salt and pepper. Cook for a minute or two, then add the wine. Let it come to a simmer, then add the tomato sauce. Cook, stirring as needed, until the peppers are fork tender, but not mushy - or until they're cooked to your liking. If the sauce reduces too much, add water to keep it saucy. Put the sausage in the bun. Add the peppers and as much sauce as you like. Top with onions. You should have enough toppings for at least six sandwiches, but it depends on how much you like the toppings. I've been known to make a sandwich with just the toppings, and maybe a bit of melted cheese inside the bun. Yes, I'm serious. The cooks were all abuzz about our sponsor, Honey Ridge Farms, a company that is all about the bees. The company was founded in 2004 by Leeanne Goetz, just part of a beekeeping family. Leeanne's oldest son, Ryan, is fifth-generation beekeeper who worked alongside his grandfather Edmund Varney as a teenager to learn his craft. Ryan is now the caretaker of 4,000 colonies that pollinate a variety of crops throughout Oregon, Washington, Idaho and California. Leeanne said, "We believe honey is nature's best and most delicious sweetener. All of our honey is sourced from family and a small circle of Pacific Northwest beekeepers, all of whom we know personally and professionally. We're proud to offer only superior, local USA honey products." The cooks who participated in this sweet challenge received Honey Ridge Farms Clover Honey Crème and Balsamic Honey Vinegar, made entirely from honey mead and made a huge variety of both sweet and savory dishes. For more about Honey Ridge Farms, follow them on Facebook, Twitter, or Pinterest. I live in Indianapolis and I was trying to track down some really good feta. My search took me to a shop that advertised itself online as specializing in Greek and Mediterranean items. I meandered around the shop, a little overwhelmed by the array of spices, cheeses (6 brands of feta! ), pickles, contraptions. I took the shop owner’s recommendation and brought home a Bulgarian feta. I know. Bulgarian feta? What? But I’m really glad I put my faith in the shop owner. This feta is so creamy, slightly tangy and just enough brine. It slices and cubes beautifully for OCD people and yet crumbles just as easily. Sorry, this is a long tangential story to say that I’m really into the wide array of flavors coming from the countries surrounding the Mediterranean and its lesser seas. All too often, when I think of Mediterranean flavors, I think “Greece” or “Italy” maybe “Spain” and kinda stop, but of course there are the North African countries (hello, Morocco! ), Middle Eastern countries, and then the landmass loops back around to the East European countries. When I look at the food and dominant flavors, I don't see distinct borders. I see the Mediterranean flowing into the Aegean or the Ionian into the Adriatic. I see more commonality and fewer differences. I’m not getting into the politics of the varying conflicts in our world and I’m not naïve enough to think that having one giant dinner party would solve our world’s problems (though that would be kinda awesome), but I do think it’s important to remember our commonality across cultures and borders and how it all flows. 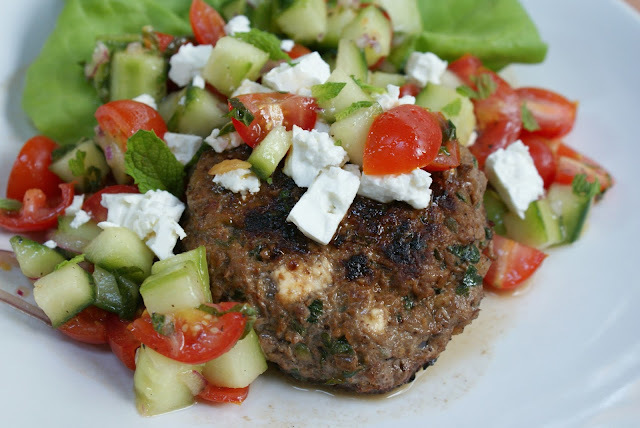 With that in mind, I developed this recipe while on a Greek food kick and happened to shop at a Mediterranean store which opened my eyes to the wide range of flavors and condiments of the region while noting the similarities from one culture to the next. If I’ve inspired you to explore the flavors that I’m writing about, then I’ve accomplished something today. The grated and salted zucchini will release some water. Squeeze the excess water from the zucchini wrapped in paper towels or a cloth. Add to a large mixing bowl along with the onion, parsley, mint, and harissa. Toss gently to distribute the harissa. Sprinkle the dried spices evenly over all. Toss to combine. Add the Cluck 'n Moo Ground and crumbled feta and combine gently using both hands. I know, it’s raw meat, but I think you get the best results from mixing by hand. Try not to over work the mixture. Form 6 patties and keep covered in refrigerator until ready to cook. Season with a bit of salt and pepper before cooking. Serve with tomato and cucumber salad, garnish with crumbled feta, tzatziki, with or without buns (we went the lettuce wrap route, good, but messy!) and more harissa! I have a confession. I originally intended for this to be a grilling recipe, but the day I had set aside to make my recipe, it rained. A lot. A rare rainy day in May in California. Well alrighty then, change of plans. I baked my loaves in the oven instead. And they were delicious. That being said, let me tell you this…if you've never had a meatloaf grilled outside you MUST try it (I've included grilling instructions below.) The loaves get a wonderful crust all around the outside and during the hot summer months you can still have meatloaf without turning on the oven and heating up the inside of your nice, cool house. Add some baked potatoes that you've cooked on the grill and some lovely sliced cold tomatoes and there’s nothing better! The ground chicken and beef blend from Cluck 'n Moo is lower in fat than just plain ground beef, so its healthier. It's hormone and antibiotic free and from humanely raised chickens and grass-fed cows (aka clucks and moos.) Keep in mind, part of the Cluck 'n Moo blend is poultry, so it's very important to cook it to a safe temperature (165°F.) 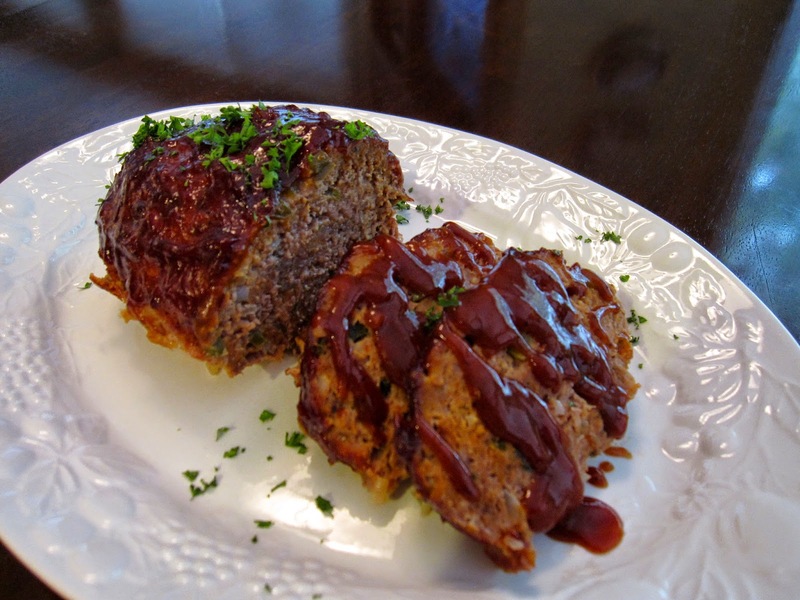 It made quite a tasty meatloaf! Enjoy! Warm olive oil in a skillet over medium heat. Sauté shallot, onion, bell pepper and garlic for 8 minutes. Transfer to a plate and set aside to cool. Place the 2 pounds of Cluck 'n Moo in a large bowl. Add beaten egg, panko crumbs, Worcestershire sauce, tomato sauce, parsley, salt and pepper and gently mix together. Add cooled sautéed veggies and mix all together. Divide mixture in half and form 2 loaves. They will cook much better and faster as two 1-pound loaves than if you made one big 2-pound loaf. To bake in the oven: Preheat oven to 350°F. Get a baking pan and a rack and cover both in foil for easy clean-up. Poke several holes in the foil covering the rack, so any juices will run through. It’s a personal thing, but I’ve never been a fan of meatloaf that cooks in a loaf pan full of drippings, so I started doing it this way and it’s been great. This method allows for more of a crusty surface all around and not just on top. Place your two loaves on the rack and brush all over with your favorite BBQ sauce. Basting with BBQ sauce every 20 minutes, bake loaves until internal temperature reaches 165°F (mine took 1 hour, 40 minutes.) Remove from oven, cover with foil and let rest for 10 minutes. Slice and serve with more BBQ sauce on the side. above and place on a baking sheet or large plate to carry out to grill. With a large spatula, gently place loaves directly on rack in a heated grill (yep, no pan…directly on the rack.) Following the basting instructions above, grill loaves over indirect medium-low heat with lid closed (unless you are basting) until internal temperature reaches 165°F (time will depend on your grill.) You won't even need to turn them! Remove loaves from grill onto a baking sheet and cover with foil and let rest for 10 minutes. Slice and serve with more BBQ sauce on the side.